It’s going to be difficult for AMC’s ad department to come up with fresh Walking Dead promos for the next two months, given they’ll be forbidden to show ELEVEN of the show’s characters. What this means is lots and lots of one character — Negan. The bat-wielding jackass declares “I am everywhere” in this new spot, and it is certainly going to feel like it whenever ads run during Fear The Walking Dead. This ad made its debut last Sunday night and was made available online through AMC’s Twitter feed yesterday. Some of these glimpses of Negan are fresh, while others are recycled from earlier promos. Some of the sound bites are new, but they appear to have been taken randomly from upcoming episodes. “There are rules. You earn what you take.” “You should know….this is the ONLY way.” The only way to what? He’s seen in shadow rapping Lucille against some bars when he says this. Some sense will be made of these clips when The Walking Dead returns October 23 at 9 on AMC. 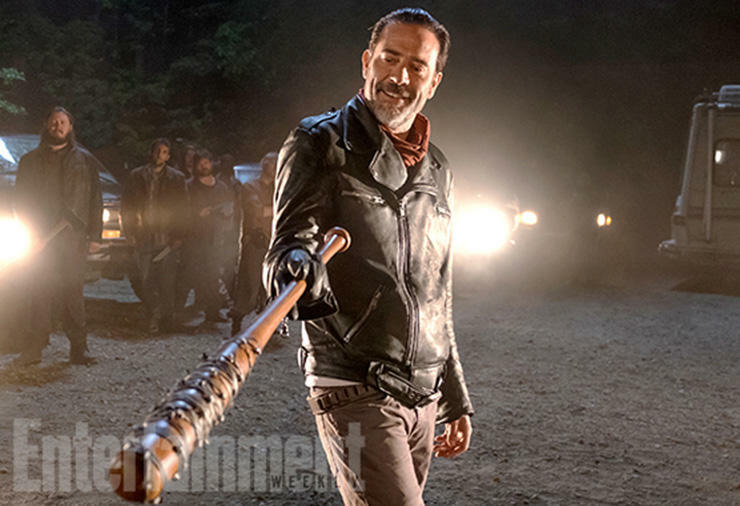 Everything you have belongs to Negan now. #TWD returns Sunday, October 23.